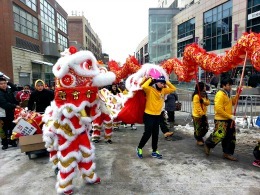 Although much of Flushing, Queens is residential, it is well known for its commercial Chinatown section, which is chock-full of dim sum restaurants and Asian malls, and hosts a huge Lunar New Year Parade and Festival every winter. The neighborhood is also home to Flushing Meadows Corona Park featuring lots of playgrounds, grassy lawns and special attractions like the Queens Museum, the Queens Theatre and the USTA Billie Jean King National Tennis Center. You'll also find historic houses from many different eras in Flushing, like the 17th-century Bowne House, the 18th-century Kingsland Homestead and the historic 19th-century Voelker Orth Museum. Our guide to Flushing, Queens has the scoop on the best places to eat, play and experience with kids. We hope you enjoy getting to know the neighborhood with your family.